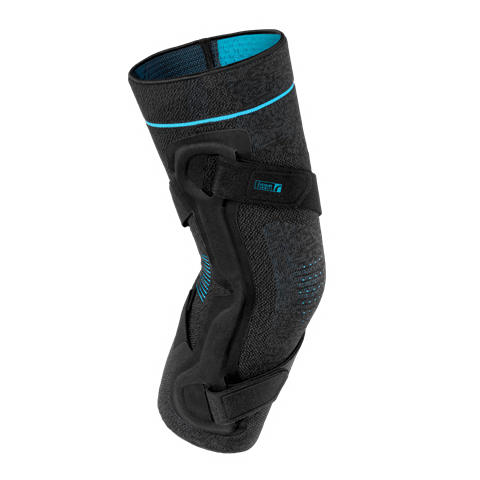 Össur Formfit® Pro Knee OA is a unique, compressive knee sleeve with a Dynamic Force Strap system, designed to provide pain relief from the early stages of osteoarthritis (OA). The dynamic, 3-D MotionTech™ knit is supportive and meets certified medical grade compression requirements, and has been proven to be superior to the leading brands at moisture wicking and breathability, keeping your knee cool during wear. CoolVent™ technology in the popliteal area enhances breathability and comfort, while the distinct patella graphics help with intuitive placing of the sleeve. The integrated StayBilizer™ hinge, constructed from lightweight, flexible EVA material, is suitable for sports, such as football. Required measurements for calf circumference 15 cm (6”) below mid-patella and thigh circumference 15 cm (6”) above mid-patella.